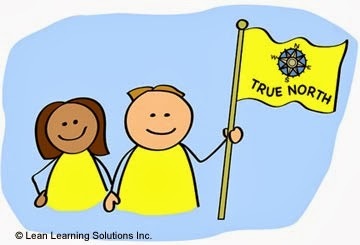 Strategy Deployment begins with True North -- our strategic and philosophical Purpose. "Is the process behaving as expected?" Corollaries: Do I understand my process? Is our hypothesis sound? If not, how do we adjust it? "Is there creative tension in our management process? Corollaries: Are problems visible? Are we challenging ourselves or simply resting on our oars? True North works much the same at the broad strategic level. In my view, its purpose, at each "level of magnification", is to create discomfort, and reflection (hansei) thereby. Success is the enemy of future success. What quality do outstanding individuals (and organizations) share? Relentless self-examination -- after defeat, and more importantly, after success.